To Fit: Saab 9-3 4 cylinder petrol 2000 to 2003 with B205 or B235 engine types, (please email us with your VIN number if at all unsure as to suitability prior to ordering). The 9-3's are renowned for crank case ventilation hose failure. The main symptoms of this failure are 'squidgy' pipes, which can eventually collapse completely and can also contribute to the known problem of 'engine oil sludging' possibly leading to premature engine failure. 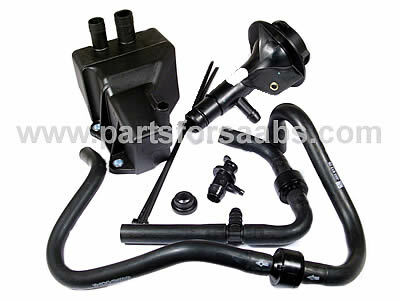 This kit is the upgrade kit released by Saab to try and prevent the problems mentioned above, as well as to cure possible engine oil leaks. Please note that this kit does not include every part on the PCV system, as stated in the Saab service bulletin linked below, other hoses may also be required. Please click here to see additional supplementary kit if required. Click here to read/download Saab Service Bulletin including fitting instructions.